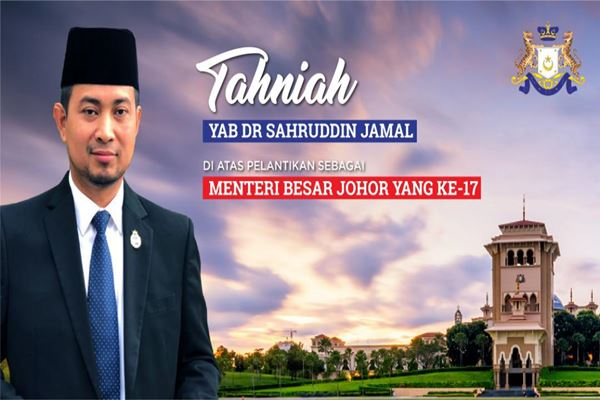 JOHOR BAHRU, April 14 (NNN- Bernama) — Bukit Kepong assemblyman Dr Sahruddin Jamal was sworn in as the 17th Menteri Besar of Johor at Istana Bukit Serene here today. Dr Sahruddin, 43, was Johor Health, Environment and Agriculture Committee chairman before this. Born on May 26, 1975, the Johor Pakatan Harapan (PH) secretary holds an MBBS degree from Universiti Hasanuddin, Makassar, Indonesia. Before entering the realm of politics, he operated his own clinic, Klinik Dr Sahruddin, in Bukit Pasir, Pagoh. His wife Dr Nila Armila Mukdan is also a doctor and they have three daughters. In the 14th General Election (GE14) last year, Dr Sahruddin, from Parti Pribumi Bersatu Malaysia (Bersatu), won the Bukit Kepong seat, which was previously known as Bukit Serampang. He defeated Barisan Nasional candidate Mohd Noor Taib by a majority of 1,273 votes. Dr Sahruddin was also seen playing an instrumental role in tackling the toxic waste contamination crisis involving Sungai Kim Kim in Pasir Gudang, which lasted about two weeks last month. More than 100 schools had to be closed while the health of hundreds of people were affected due to the release of hazardous gases from the contamination. He was hands on throughout the crisis and utilised his medical expertise to screen victims down with what was dubbed the “Kim Kim Symptoms”. Speculation became rife that he was to be the next menteri besar of Johor when he was the official representative of Menteri Besar Datuk Osman Sapian for the Malaysia-Singapore Leaders’ Retreat in Putrajaya on April 9, a day after Osman had a meeting with Prime Minister Tun Dr Mahathir Mohamad. The meeting was understood to be about the status of Osman as MB. Dr Mahathir announced Osman’s resignation as MB of Johor the next day (April 9). In GE14, Johor PH (made up of DAP, PKR, Amanah and Bersatu) won 36 seats out of the 56 seats at stake. BN won 19 and PAS one. Out of the 36 seats, DAP won 14, Amanah (nine), Bersatu (eight) and PKR (five). However, Bersatu’s tally increased by three when three independents, Alwiyah Talib (Endau) joined the party in September while Rasman Ithnain (Sedili) and Rosleli Jahari (Johor Lama) followed suit in November. This changed the composition in the State Assembly to PH having 39 seats, BN 16 and PAS one.